Branding is an essential part of building the career you want. Your brand is derived from who you are, who you want to be, and who people perceive you to be. Creating a positive impression should reverberate through your actions, words, attitude, and attire. Your professional brand reflects who you are and what you do best. The first step to discovering your brand is actually a step backward to ask such basic questions as, ‘What are my career goals?’, ‘Who is my target audience?’, ‘What are my strengths and natural talents?’ and ‘What are my interests?’ The act of defining and understanding your career brand is an introspective experience, and the process of articulating your message leads to informative and personal insight. In total, the experience helps you to fully express what you do well and why you do it well. In today’s highly competitive market of quick resume scans, including images as part of your brand gives you the advantage of communicating textually and visually. Content-rich images grab the reader’s attention and achievement-based language drives the message that you are a highly capability professional. Start with the right numbers to create a graph that tells a powerful story. Clear and concise measures graph with spectacular results into easy-to-understand metrics that quickly illustrate your successes. Ambiguous language and complicated descriptions only lead to confusing images that do more harm than good. In this example, I’ve included a statement from a client’s original resume. On the surface it sounds like a good accomplishment for a QA Analyst and Regression Tester. And in fact it is, but the statement hides the real impact and value of the achievement. Designed an rtest system that did 20 times as much in 5 times less time. Re-worded, this statement becomes a straight-forward and direct statement of a tremendous achievement. Provided 100-fold improvement in overall system performance: increased throughput by a factor of 20 and reduced processing time by a factor of 5. It is now in a form that can be graphed, becoming the focal point of an attention grabbing resume. When words don’t communicate your thoughts concisely or deliver the desired impact, there is another step you can take to market your professional brand. A graph or chart that illustrates your stellar sales numbers, resource savings, workforce productivity increases, or efficiency upgrades in business processes can evoke a positive perception of directly impacting the bottom line. When you have straight-forward measures that can be represented over time, creating a chart is an easy choice. Illustrating a 50% increase in revenue over 3 years or a 15% reduction in capital expenditures for each of the last 3 quarters, graphs nicely. 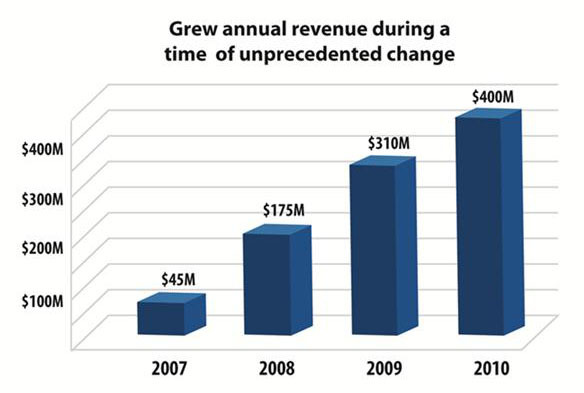 Including a branding statement— Grew annual revenue during a time of unprecedented change—sends a very clear message. The graph on the right quickly demonstrates my point. Line Graphs for complex measures. When the numbers are more complex and comparison of several measures is the story you want to tell, then a line graph works well. It allows you to scale down the image in your resume, yet still look clean and crisp. Adding too much information or illustration will only confuse the reader. Combining text with a content rich image delivers a lot of information in a small amount of space. In this example, I used the left hand side of my client’s resume to describe his qualitative achievements textually, and then inserted an image on the right to graph his phenomenal quantitative results. See for yourself how well it worked. Revitalized an indirect sales program that was losing millions year after year. Reached break-even point one year after assuming control. Restructured sales program to incentivise sales team to exceed quarterly goals, increasing revenue by 480% to a high of $60M in year 2010. Simultaneously increased customer satisfaction to a corporate high of 95%. Conducted in-depth analysis of process costs, reducing fixed and variable costs to a low of $12M in 2010. Creating a visual representation of your brand is another highly-effective way to use images. The talents, experiences, skills, and personality that strongly define you as a professional can be illustrated as eye-catching images that grab the attention of the reader and leave a lasting impression. This sets the context for how they interpret your resume. Content rich images tell a complex and compelling story that delivers your brand and creates the perception that you communicate well both verbally and visually. Adding your career branding image to your resume, Linked-in profile, and business cards makes you memorable. It creates an opportunity at networking events to engage people in a conversation about your brand, your successes, and your career goals. In this example, I created an image that reflected my client’s unique approach to building organizations from the ground up. The following statements were peppered through her resume. Inspires creative thinking and an entrepreneurial spirit that builds powerful product portfolios. Developed PMO competency model and services as the baseline for newly created Competency Centers. Provided performance visibility and tracking to ensure ongoing professional development. Enterprise-wide, integrated the capability to continuously measure and improve service quality throughout the customer lifecycle. Drove development of emerging technologies that provided high- visibility and multiple industry awards; generate more than $68 million annually. Of note, is that my client crafted a unique methodology based on the best practices she learned for her industry after successfully using the Balanced Scorecard approach on multiple occasions. 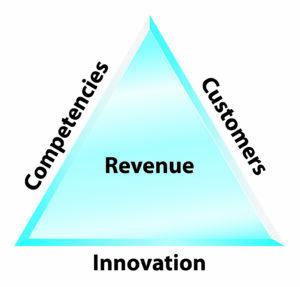 This created a perfect opening to discuss how she transformed the Scorecard’s 4 quadrants into a triangle by balancing competencies, customers, and innovation to produce great financial results. Your multi-dimensional and well-balanced career plan or job search needs to respond to the competitive nature of the current marketplace. Building a powerful brand and delivering a consistent message—through your executive resume, and LinkedIn, Google, VisualCV, and Twitter profiles, as well as at professional events is a mandate. Incorporating images into your message captures the attention and interest of employers, recruiters, and other professionals who can further advance your career goals.